~ The child denigrates the alienated parent with foul language and severe oppositional behavior. ~ The child offers weak, absurd, or frivolous reasons for his or her anger. ~ The child is sure of him or herself and doesn't demonstrate ambivalence, i.e. love and hate for the alienated parent, only hate. ~ The child exhorts that he or she alone came up with ideas of denigration. The "independent- thinker" phenomenon is where the child asserts that no one told him to do this. ~ The child supports and feels a need to protect the alienating parent. ~ The child does not demonstrate guilt over cruelty towards the alienated parent. ~ The child uses borrowed scenarios, or vividly describes situations that he or she could not have experienced. ~ Animosity is spread to the friends and/or extended family of the alienated parent. ~ In severe cases of parent alienation, the child is utterly brain- washed against the alienated parent. 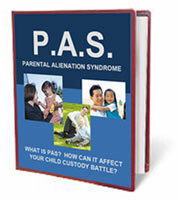 The alienating parent can truthfully say that the child doesn't want to spend any time with the other parent. ~ When told that the child MUST spend time with the other parent, the alienator typically responds, "There isn't anything I can do about it. She/he just doesn't want to be with you." a child has been bribed or manipulated into turning against one of the parents"
Use in Child Custody Disputes? turning against one of the parents"
Dr. Bricklin and Dr. Elliot are nationally-known child custody experts. One of the saddest situations happens when a child has been bribed or manipulated into turning against one of the parents--and frequently this parent is the better of the two parents. An actual case from our files illustrates what we are talking about. The daughter, a bright young girl of eleven, creates havoc whenever her parent, a warm and hardworking professional, attempts to phone or pick her up for a visit. Unfortunately, most mothers or fathers singled out to be the victims of such vitriolic attacks are poorly equipped to deal with them. They start out trying to be calm and loving, but all too soon are worn down by the hurt, frustration and road blocks continuously thrown up when they attempt contacts with the child. They end up either retreating, or counter-attacking---neither of which can lead to a happy outcome. If you are caught up in this kind of trap it is essential that you learn the four strategies that can be truly effective and helpful in this situation. Your printable copy of these publications will be delivered in PDF format. If needed, a free download of Adobe Acrobat will be available. ALL computers (PCs & MACS) will be able to quickly and easily download these publications. Books is Easy & Secure! After you click on the link at the bottom of this page you will be taken to an Order Form where you can provide your billing information. After your billing information is authorized you will be automatically transferred to a Thank You Page that will contain the link to your Download. Clickbank sells our products - they are a trusted online retailer specializing indigitally delivered products.